Broadcom completed its acquisition of Brocade Communications Systems. Brocade will operate as an indirect subsidiary of Broadcom and will be led by Jack Rondoni as General Manager. Previously, Rondoni served as Senior Vice President of Storage Networking at Brocade, having joined the company in 2006. "We are pleased to complete this transaction, which strengthens Broadcom's position as a leading provider of enterprise storage and networking solutions and enables us to better serve our OEM customers," said Hock Tan, President and Chief Executive Officer of Broadcom. "Broadcom has a track record of successfully integrating and growing companies we acquire, enabling us to offer customers a leading portfolio of best-in-class franchises across a diverse set of technologies. We intend to invest in and grow the Brocade business to further enhance its capabilities in mission-critical storage networking." Broadcom agreed to acquire Brocade Communications Systems for $12.75 per share in an all-cash transaction valued at approximately $5.5 billion, plus $0.4 billion of net debt. 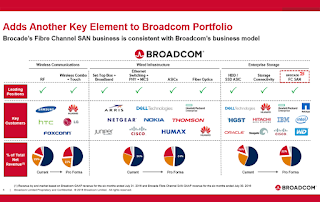 Broadcom plans to keep Brocade's Fibre Channel storage area network (FC SAN) switching business and divest Brocade’s IP Networking business, consisting of wireless and campus networking, data center switching and routing, and software networking solutions. Broadcom expects to fund the transaction with new debt financing and cash available on its balance sheet. 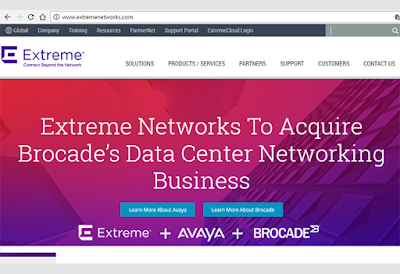 The companies said the deal is not subject to any financing conditions, nor is it conditioned on the divestiture of Brocade’s IP Networking business. 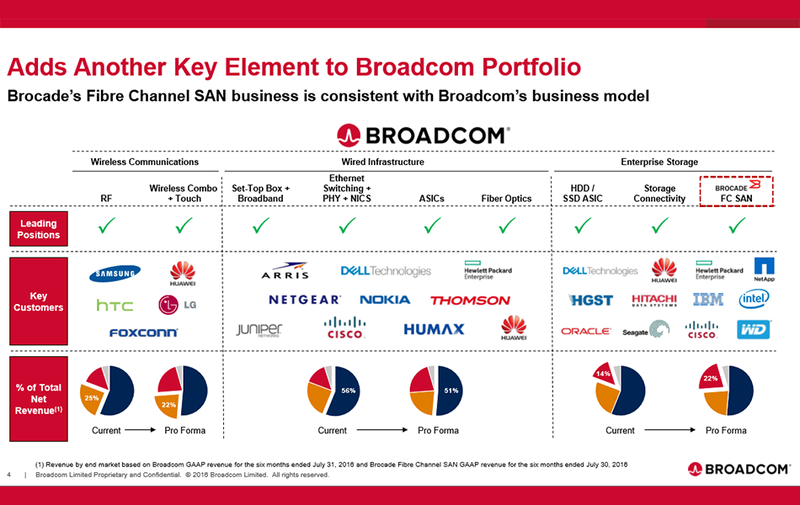 Broadcom said key reasons for the acquisition include the profitability margin for Brocade's FC SAN business, which currently comprises vast majority of Brocade’s non-GAAP operating profit. 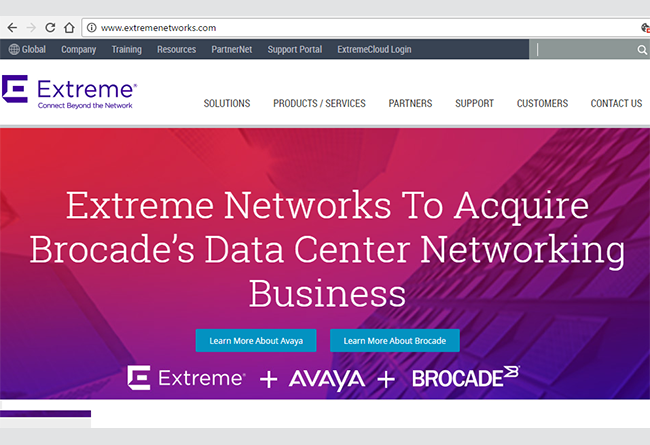 Extreme Networks agreed to acquire Brocade Communications Systems' data center switching, routing, and analytics business from Broadcom following Broadcom's acquisition of Brocade. The deal is valued at $55 million in cash, consisting of $35 million at closing and $20 million in deferred payments, as well as additional potential performance based payments to Broadcom, to be paid over a five-year term. The sale is contingent on Broadcom closing its acquisition of Brocade, previously announced on November 2, 2016 and approved by Brocade shareholders on January 26, 2017. Broadcom presently expects to close the Brocade acquisition in its third fiscal quarter ending July 30, 2017. 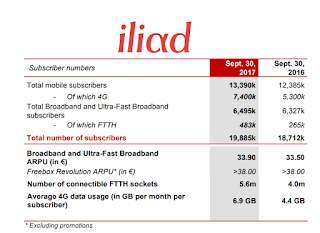 Iliad reported strong financial results for the first nine months of 2017 as its number of 4G subs and FTTH customers across France continued to rise. Iliad's consolidated revenues rose 6.6% year on year in the first nine months of 2017, to €3,710 million. During that period, revenues for Broadband and Ultra-Fast Broadband climbed 4.7% to €2,087 million and Mobile revenues advanced 9.0% to €1,630 million. Added 64,000 new FTTH subscribers in the latest quarter for a total of nearly 500,000 subscribers. Ongoing deployment of 4G frequencies, with 1,100 sites newly equipped to use 1,800 MHz, 100 new sites equipped for 700 MHz and 560 sites for 2,600 MHz. 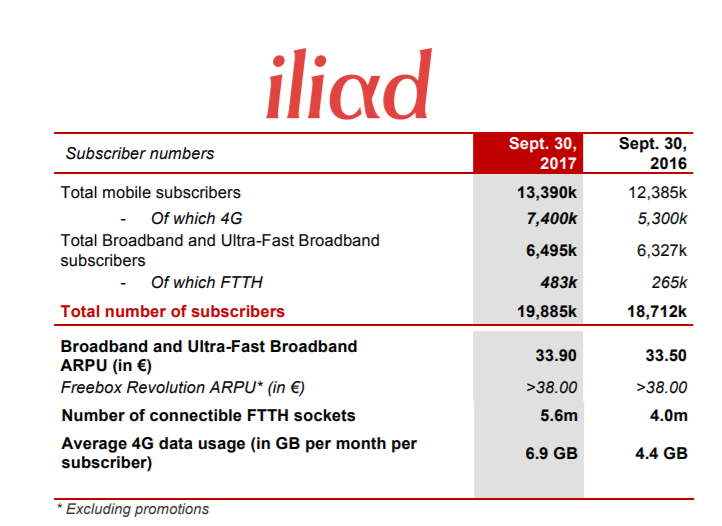 Iliad's 4G network now covers more than 84% of the French population. Iliad's 3G network now has a total of 11,300 sites, representing an increase of over 1,000 during the quarter. 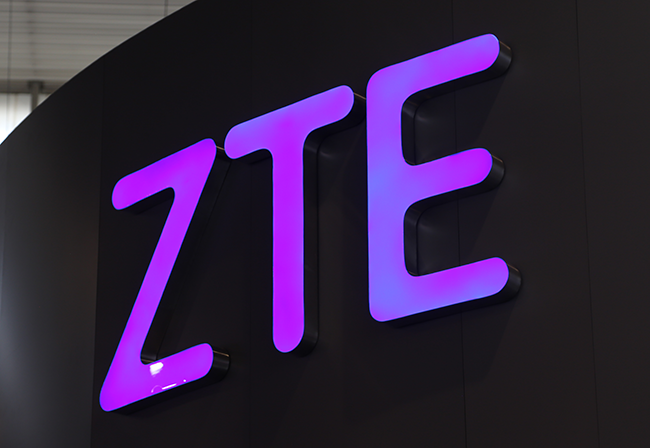 ZTE, China Mobile, and Qualcomm demonstrated an end-to-end 5G NR Interoperability Data Testing (IoDT) system data connection based on 3GPP R15 standard - an industry first. The IoDT connection demonstration took place at China Mobile’s 5G Joint Innovation Center, and utilized ZTE’s 5G NR pre-commercial base station and Qualcomm Technologies’ 5G NR sub-6 GHz UE prototype. The end-to-end 5G NR system operates in 3.5GHz and supports 100MHz bandwidth, compliant with the 3GPP Release-15 5G New Radio layer 1 framework — including the scalable OFDM numerology, new advanced channel coding and modulation schemes, and the low-latency self-contained slot structure. 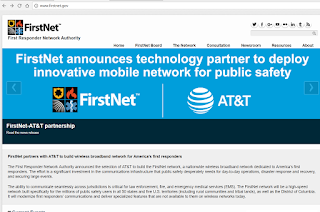 The state of Georgia has accepted the FirstNet and AT&T plan to deliver a wireless broadband network to the state's public safety community. Under the public/private partnership, first responders in Georgia, including fire, police, EMS and other public safety workers, will have access to quality of service and priority to voice and data across the existing nationwide AT&T LTE network. Preemption for primary users over the AT&T LTE network is expected by year-end. 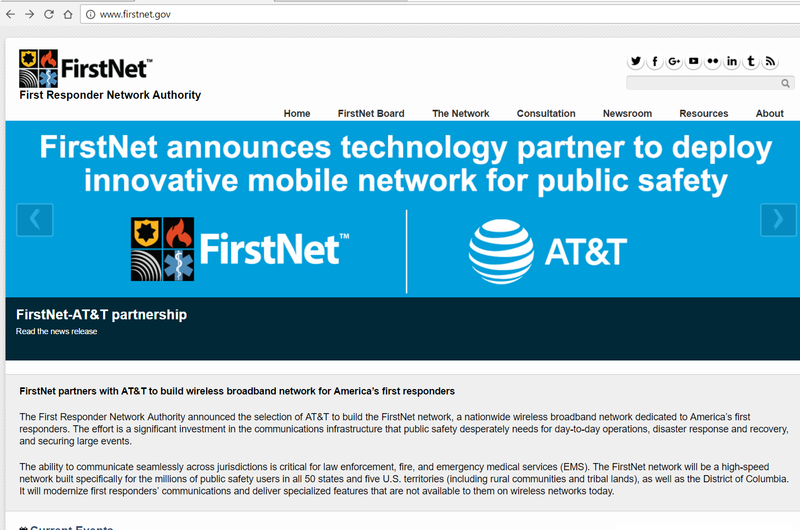 "FirstNet will provide the coverage, experience and next-generation technologies our first responders need and deserve," said Bill Leahy, president of AT&T Georgia. "AT&T is proud to work with Governor Deal to bring this dedicated, interoperable public safety broadband network to Georgia, and connect its public safety community to advanced technologies that will help save lives." Interoute has opened a new point-of-presence (PoP) in Sydney, Australia. Interoute cited growing customer demand for expanded global cloud coverage in the Asia Pacific region. The Sydney POP also and extends the reach of Interoute’s new Edge SD-WAN services. The Interoute Cloud Fabric binds together all Interoute VDC cloud zones, co-location facilities, PoPs, as well as third-party cloud providers with Interoute’s ultra-low latency private network backbone. Shell has selected AT&T to provide strategic services like network management and integration, global voice and data services, security, video and collaboration solutions. 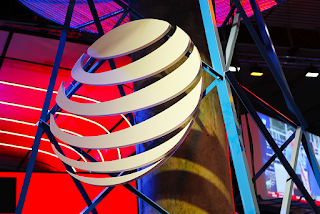 AT&T will deliver network capabilities and network integration services across multiple vendors that are designed to support virtualized services, cloud strategy, and hybrid network solutions. The agreement builds an existing relationship spanning the last five and a half years. Financial terms were not disclosed. IDC sees a steady increase in spending for IT and business services worldwide. 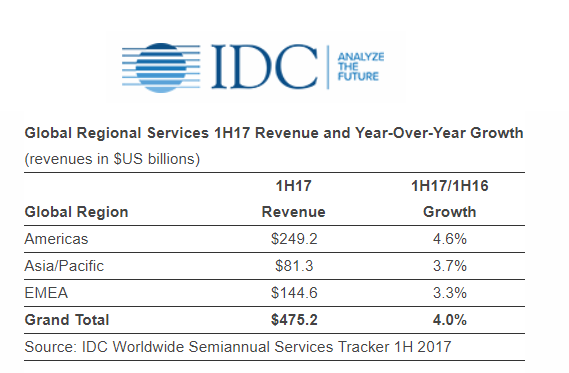 According to the International Data Corporation (IDC) Worldwide Semiannual Services Tracker, revenues for IT Services and Business Services totaled $475 billion in the first half of 2017 (1H17), an increase of 4.0% year over year. 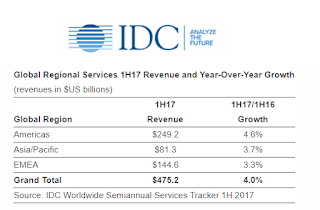 IDC expects worldwide services revenues to surpass $1.0 trillion in 2018. IT outsourcing and software deploy and support services.